The whole fun about multi day hiking is finding out how much stuff you actually don't need to have in your life. It's all about many years of trials and errors, trusting your ability to survive with just two T-shirts instead of five (and that you might be ok without that pillow) and gradually reducing your backpack weight to the point where you finally feel free. We now carry only what we really need, sometimes even less. We rarely buy new things. As a matter of fact we've had the same backpacks, hiking boots, tent and sleeping backs for the last 7 years and they all withstood a test of time and all elemental forces out there. The gear list provided below is an example of lightweight hiking gear that we take with us on an average 1-2 week hiking trip in "three season" conditions that are common for mountain ranges in Australia, Tasmania, New Zealand and Hawaii. Most of our trips that we talk about on our blog fit into this category with very few chances to re-supply during the trip, so we're used to carry everything we need with us. Despite the length of these trips our backpacks rarely exceed 18 kg. 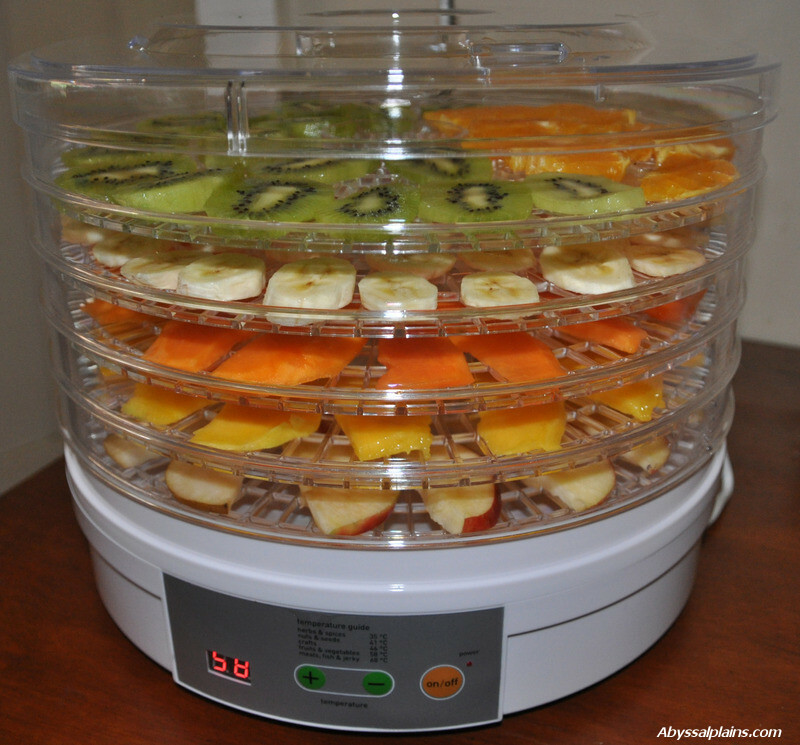 The biggest contribution to our lightweight backpacking was our new food dehydrator that easily trims away third of our backpacks' weight and we absolutely recommend to get one for everyone who goes regularly on multiday hikes. We don't eat any processed foods and being able to prepare any of our delicious, nutritious and homemade meals (including our all-time favourite - dried mango) is probably the most exciting thing that has happened in our outdoor lives. Enjoy lightweight backpacking! Carry in less, carry out more. Oatmeal porridge: Rolled oats with dehydrated bananas, walnuts, blueberries and goji berries, dried almond milk or soy milk. Prepare individual portions in resealable bags and just stir-in hot water in the morning. Buckwheat porridge: Dehydrate the cooked buckwheat porridge before the trip, add dried apples, cinnamon, chia seeds and dried almond milk or soy milk. Prepare individual portions in resealable bags and just stir-in hot water in the morning. Hot cacao: Mix raw cacao with pea-protein powder, stevia, chilly and dried soy milk. Add hot water to get a delicious warm drink. Nuts and seeds: Prepare a delicious trail mix with your dried fruits and various nuts and seeds: walnuts, brazil nuts, almonds, hazelnuts, macademia, coconut, pumpkin seeds, sunflower seeds, etc..
Dinner: we usually cook about 4 dinner meals and have about 3 portions of it each. Then during 12 day trip, for example, we just alternate between them. Lentils, carrot, spinach and quinoa soup with parmesan cheese: Cook and dehydrate the soup before the trip. 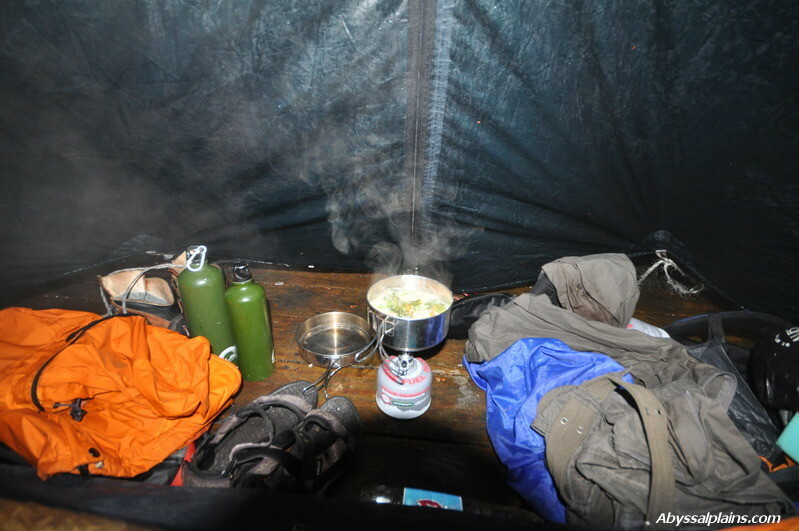 On the trip, soak the dehydrated soup mix in cold water for 15 minutes and bring to boil for 5 minutes. Add parmesan cheese as needed. Buckwheat noodles with soya meat and broccoli in tomato sauce: Dehydrate the broccoli and tomato sauce before the trip. On the trip, add water and bring to boil, stir in dried noodles and soya meat. Mushroom risotto: Cook and dehydrate the risotto before the trip. On the trip soak the dehydrated mix in cold water for 15 minutes and bring to boil for 5 minutes. Beans casserole with sweet potato, brocolli, carrots and tofu: Cook and dehydrate the casserole before the trip. On the trip, soak the dehydrated mix in cold water for 15 minutes and bring to boil for 5 minutes.